Yun Gee was born in Canton, China, burst into creative expression in San Francisco, nourished his art in Paris, and finally came to New York where he lived harrowing, bleak years and died. His earliest artistic activity took place in San Francisco in 1926 and 1927. He employed “Synchromist” devices to formulate a personal statement. The structure of his paintings was based on meshing areas of vivid colors. He achieved a quality best described as transparency; one feels that the colored area lies beyond the physical substance. He often placed an airy color inside a solid shape, a head of pine, and so achieved a penetration of space and solid. He composed the painting by building from the center so that the sense of the painting was based upon the relationship of the parts to the living center, the painting’s cortex. All this was done in his twentieth year. He then went to Paris. Very soon, Yun changed the color and structure of his paintings. He defined his shapes more decisively and buried the once bright color strokes in larger, denser forms. What he lost in vivid scintillating color effects, he gained in the volume and weight of the forms. A serious and noble architecture underlies the Paris paintings. 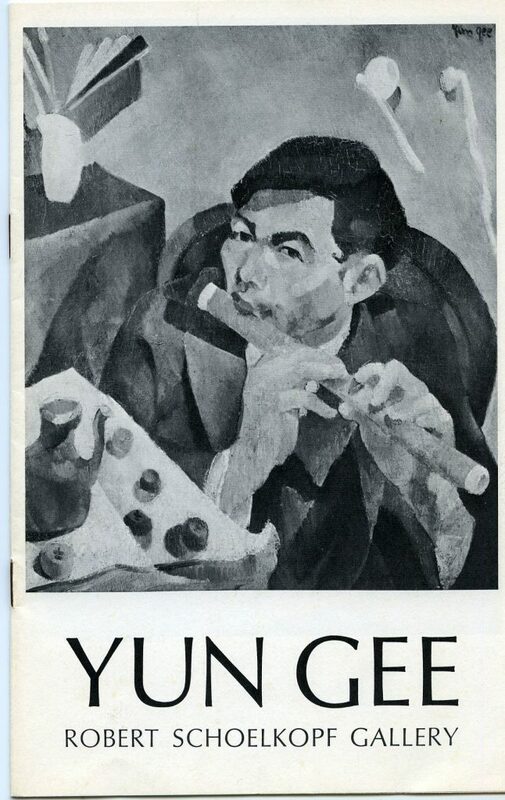 Yun Gee came to New York for the first time in 1930. It was then that he painted his masterpiece, Wheels: Industrial New York (exhibited at the Museum of Modern Art in 1932). In that work he combined the glittering color contrasts with the large, decisive forms of his Parisian work. Drawing upon resources for symbolic imagery hitherto absent from his work, he characterized the galloping frenzy of the new world in the ballet of polo players in the foreground. A vision of New York skyscrapers rises above the players; finally, above the Brooklyn Bridge, hovers a pink glowing celestial sphere. Below the bridge one finds a chilling spectre: a crudely drawn man, falling, arms upraised, dressed like a Chinese. Yun’s brilliance is matched by his terrible lingering descent into madness and death. In the 1940s, he married and fathered a child. But shortly afterwards, he fell ill and was never again to resume normal living. The fully realized paintings of his early flowering, exhibited here for the first time in New York, make us experience the more deeply the extent of his tragedy.